We open this year's festival with a new short film from last year's Featured Film Maker, Ben Proudfoot, of Breakwater Studios (Halifax and Los Angeles). Kunstglaser is a vivid depiction of the life and work of Nova Scotia stained glass craftsman ("Kunstglaser") Norbert Sattler, who will be at the festival tonight. Quebec's Quiet Revolution brings about cultural and political changes that lead many thousands of anglophones--including Walker's family--to leave the province. A group of former coal miners, all members of Cape Breton's Men of the Deeps chorus, reflect on the closure of their mine and the effect on their community. Although made over a decade ago, this film is still timely as the mine in question (Donkin) reopened this year. compete for the Audience Favourite Short Short Film. Break for a few minutes for voting on the "Short Shorts"
compete for the Audience Favourite Short Film. Break of a few minutes for voting. Special non-competing presentation [while the votes are counted]. Thor Lengies will show part of his series Canadian History on DVD (The Battle of the Gulf of St. Lawrence and the Oil Crisis of 1942), followed by a Question & Answer session. A haunting Maritime fantasy about an unhappy wife, who longs for her husband to drown at sea. One of our most-requested films, this biography/war drama covers the true story of a woman who won't give up when her best friend is struck in the head by a Taliban axe. There will be an introduction from cinematographer Victor Stegemann and time for Questions & Answers afterward. 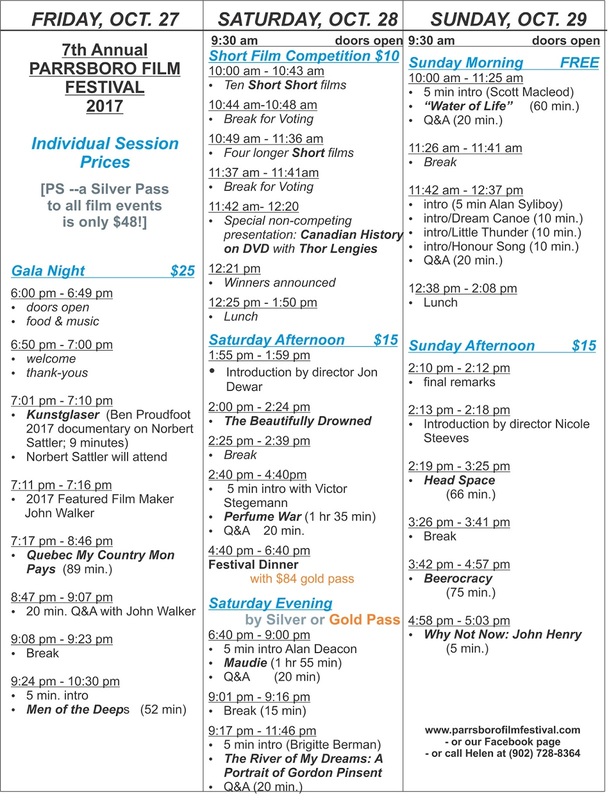 For Gold Pass holders, the Festival Dinner is at the BlackRock Bistro, on Main Street. Maud Lewis works as a housekeeper ... and fills her employer's tiny house with her vivid paintings. Art expert Alan Deacon, who advised the film makers, will introduce the film. There will be time for Questions & Answers afterward. Presented by the director, who will be available afterward for Questions & Answers. Four short tales from Canada's history, each from a different speaker, woven into a single hour-long film. Three short films presented by Mi'kmaq artist Alan Syliboy. Presented by the director, who will be available afterward for Questions & Answers. Floyd Smith is an agoraphobic too frightened even to open his door to strangers ... but he has been summoned for jury duty. An independent film about the potential of the craft brewing industry to reinvigorate New Brunswick's economy, if archaic regulations do not keep the industry from growing. A docubiopic of young Harlem entrepreneur John Henry, who asked "Why not now?" and went from doorman to dry cleaner to dealmaker. - Based on a poem, this film uses original art with collages to illustrate how women, and their names have gone missing. Here is the 2016 schedule with ticket price information. 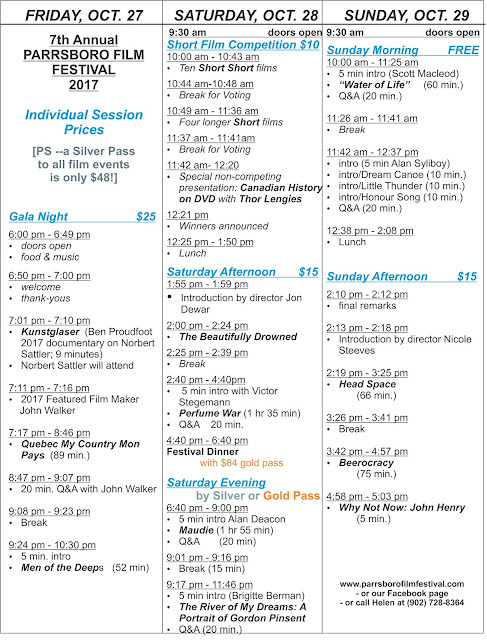 You can find details about each film or event below this chart. - "Time with 'Bubby' and the Parrsboro Rock Shop Project"
Dartmouth professor emeritus Andrew Garrod travels to Kilgali, Rwanda to mount a production of Shakespeare's Romeo and Juliet with both Hutu and Tutsi students, twenty years after the genocide against the Tutsis. A new feature for the PFF. 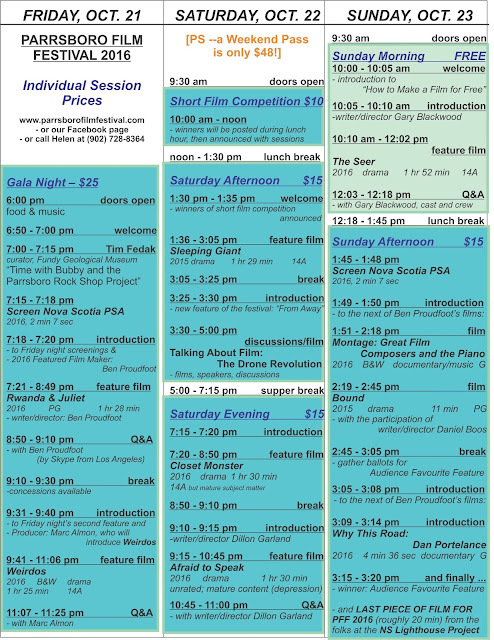 Each year, this selection of film clips, speakers and discussions will explore a currently important topic. *This session is free to everyone, especially aspiring film makers! Writer/director Gary Blackwood introduces the first feature film, The Seer, and the unusual project that led to its making. Shot in Nova Scotia, for essentially no budget. When her son disappears and no one can help, a desperate mother tries to consult a renowned -- but burnt out -- psychic. This feature-length film was made by actors who gave their time and a Nova Scotia community that gave its support. Q&A with Gary Blackwood and other members of the cast and crew of The Seer. Six film composers (with a total of 73 Academy Awards between them) create original solo pieces for concert pianist Gloria Cheng. A man queries his brother's sudden wealth ... and its source. 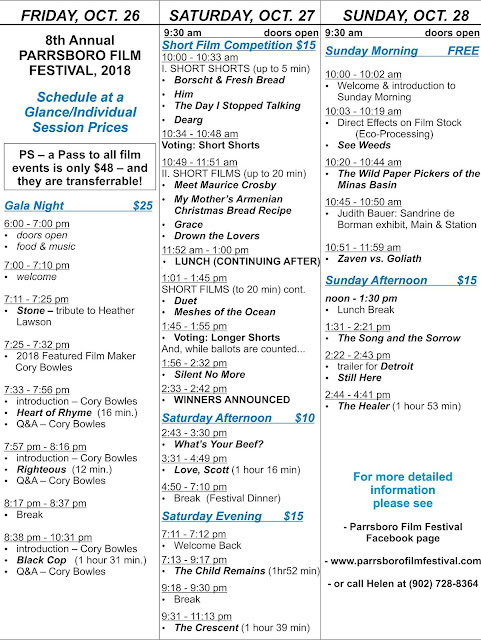 Boos was a youth festival winner at Cannes, 2010. He was the son and grandson of fish fryers in coastal Massachusetts, but Dan Portelance wanted to be a chef.